I used to think I couldn’t start my day without my daily almond milk latte. When I caught that intense virus that went around last winter, however, I went about two weeks with no coffee or caffeine as I was recovering, and something amazing happened: I realized that I actually felt a lot better without it! I felt more mellow, grounded and I actually had more energy: I was able to wake up more easily in the mornings and it felt freeing not having to depend on anything external to help me get through my day. But after a few months of absolutely no caffeine, I honestly missed having a little kick when I was working on a project or needing a little bit of a boost on those super early mornings. I used to drink matcha on occasion and really enjoyed it so I decided to incorporate it into my diet as my only source of caffeine to see how it made me feel. I am now in love with matcha! I have a matcha tea just about every day as part of my morning routine. It’s my main source of caffeine, as I’m still not drinking coffee. It gives me energy but it’s smoother and more grounding than the scattered, anxious energy coffee used to give me. So I’ve been happy to see more and more cafes and restaurants around New York serving it in different forms. I personally love making it at home with my all-time favorite, Sun Potions White Dragon Matcha, or Green Foods Organic Matcha. I use a Long Handle Bamboo Matcha Tea Whisk as well as a little water and steamed almond milk to make my morning elixir. I have always been a tea lover, but matcha is different; it’s almost like green tea that’s been kicked up to the next level of potency. Matcha is made from a tea leaf known as tencha, originating in China, but finding its true home in Japan in the 12th century, and now exclusively grown in Japan. The tencha bush is shaded from the sun, which reduces the pace of photosynthesis, which in turn, stimulates the production of chlorophyll and amino acids–part of the reason why matcha is so good for you. Another reason matcha is so packed with nutrition is that the tea leaves are briefly steamed after harvesting, which protects their color as well as their flavor and nutritional content. After this process, they are stone-ground into a fine powder. This is key: with green tea and virtually every other tea, you are only drinking the water brewed from the tea; with matcha, you are actually drinking the whole tea leaf! So it follows that you are getting loads more nutritional value. In fact, one glass of matcha is equivalent to 10 glasses of green tea in terms of nutrition and antioxidant content! High in amino acids, specifically, L-theanine and theophylline, which studies have shown help to improve cognitive function when combined with caffeine, inducing mental clarity and alertness, and reducing anxiety. Bursting with vitamins A, C, E, K and vitamin B-complex, and polyphenols and catechins, components that have been associated with increased ability of plasma to scavenge free radicals, blood vessel expansion, fat oxidation, regulation of cholesterol, and promotion of gut health. In fact, a 2003 study showed that matcha has 137 times the amount of epigallocatechin gallate (EGCG), the main catechin in tea, than regular green tea. In other words, when you drink matcha, you are essentially supercharging your body! 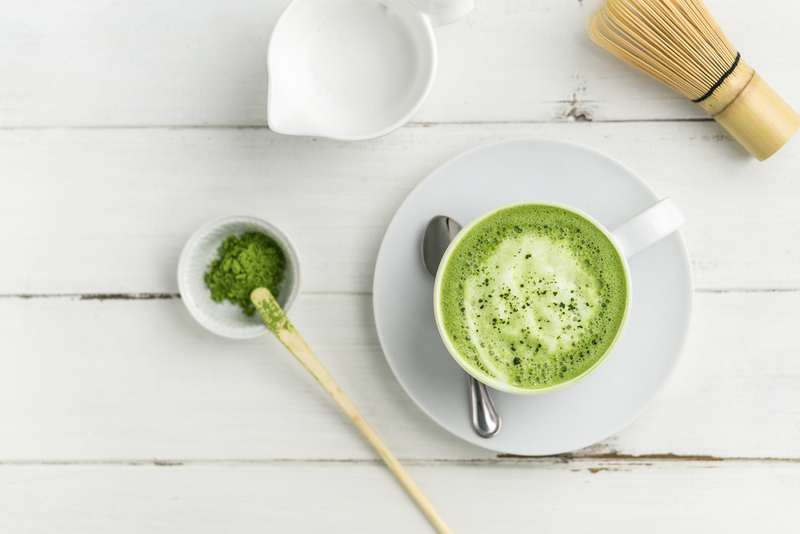 To top it off, a study in the American Journal of Clinical Nutrition actually found that consuming matcha tea can dramatically increase thermogenesis, the body’s process of burning calories. Lose weight, fight cancer and detox?! I’ll take it. But before I dive into some delicious recipes, take note that matcha does contain caffeine. In fact, matcha contains more caffeine than regular green tea, with approximately 34 mgs of caffeine to green tea’s 30 mgs (espresso has 60 mgs). But you won’t be getting as much of the crash and burn that the caffeine in coffee can give you as the L-theanine in matcha prolongs its mood-boosting effects. There are different “grades” of matcha that you’ll want to acquaint yourself with when you start incorporating it into your diet. It can get a little overwhelming, but the basics are: the greener the better. The very mossy greenest matcha is called “ceremony grade” since it was traditionally used in Japanese tea ceremonies. The traditional way to make matcha is as a tea: sift 1-2 tbsp. into a tea cup, pour in hot water, and then “froth”: whisk vigorously until the tea is frothy. Then enjoy! But if you are feeling more adventurous, check out some of these fun ways to add matcha to almost anything! Coconut Matcha Energy Bars from Sakara Life: Energy bars are great if you know you have a super crazy day ahead of you and literally won’t have a moment to sit down and eat a meal. But the ones you buy in the store are literally LOADED with sugar, not to mention all sorts of additives and preservatives. When you make energy bars yourself, however, you can control how much of each ingredient you are putting in and can feel secure that you’re using only whole foods. And adding matcha ensures that you will get a longer-lasting boost, rather than the crash and burn of sugar. Matcha Latte: Similar to my everyday morning matcha recipe sans the agave. I use almond milk and no sweetener most days, although on occasion I’ll add a tiny bit of maple syrup. If you want to get a little fancier, I also recommend this recipe for a creamy, vegan matcha latte. Gluten free dairy free matcha pancakes: Adding matcha gives these morning pancakes an earthiness and complexity that might just keep you from chowing down on a whole tower, as well as keep you satisfied for longer. Enjoy! This entry was posted in Beverages, Health & Wellness and tagged alertness, amino acids, ceremony grade, chlorophyll, coconut matcha energy bars, cognitive function, detoxification, green foods, green tea, gut health., L-theanine, matcha, matcha latte, matcha pancake, mental clarity, organic, sun potion, theophylline, whisk.